Nicholas II of Russia had a private bath, a plonge (more like a small swimming pool) at the Alexander Palace. It was place where the Emperor could relax, perhaps, read, or consider the events of that day. No kids no wifey (one assumes) in this man cave, so image the delight of his second daughter, Grand Duchess Tatiana, was allowed to use the private bath. "Papa darling, Huge thanks for allowing us to bathe in Your tub. It was immensely nice and fun and I enjoyed it terribly." This was written by Tatiana to her father on March 7, 1915. She was in her 18th year, a young woman on the cusp of adulthood. 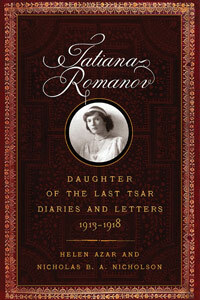 This letter is included in Tatiana Romanov Daughter of the Last Tsar Diaries and Letters 1913-1918 (Westholme:$26.00), which will be seen as an important contribution to Romanov scholarship, thanks to Helen Azar, whose native Russian-language skills are an asset in translating original Romanov documents, such as diaries and letters. Tatiana was perhaps the most gifted of the four sisters. At times her diary entries and correspondence are eloquent, as she shows concern for family and friends, even after the Imperial Family is by the Provisional Government to Tobolsk in the late summer of 1917. In exile, there were few complaints about their living conditions, and the lack of freedom. In a letter to her aunt, Grand Duchess Xenia, in September 1917, Tatiana wrote: "The weather here is wonderful." She also commented to her aunt that the house had a balcony and "it is fun to sit there and watch the street, to see the people. This is our only amusement." The final years of Tatiana's life were not amusing, but she remained proud, and kind. Her Orthodox faith and her relationships with her parents and siblings were important to her. Tatiana avoided politics and the growing revolutionary fervor in Russia that led to her father's abdication and their deaths. The collapse of their world was not on their radar. After Russia entered the first World War in 1914, Tatiana threw herself in the new duties: nursing and helping war refugees. The Committee of Grand Duchess Tatiana was formed by an Imperial Ukase in September 1914. During the next two years Tatiana was an eager nurse, taking part in surgeries including amputations. A typical day would include lessons, church services, visiting the infirmary, having meals with family members, There were few political comments, but her view on the Germans --- calling them curs when German submarines destroyed Russian ships. The murder of Rasputin by family members left an indelible impression. In a Christmas letter (1916), Tatiana wrote to her mother. "....I believe the soul of our dead Friend is always with us and that he prays for you, my sweet angel Mama." The Friend of course was Rasputin. The Revolution changed everything. 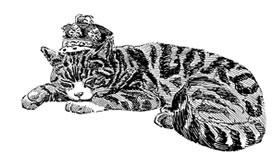 The daily nursing visits came to an end in February 1917. A month later, Nicholas abdicated, and 300 years of Romanov rule was over. The family and a few retainers were kept confined at Tsarkoe Selo. Tatiana's letters during this time period -- no diary entries --- are focused on family and keeping in contact with the outside world, especially her friends from nursing, In one letter to Zinaida Tolstoy, there is a hint of lament about not being the Crimea for the summer. "Strange to be without the sea for three years, there is no feeling of summer for me." Until the war, the Imperial Family spent summers at Livadia in the Crimea. Winters were spent at Tsarkoe Selo, which in March 1917 had become their first prison. The change in Tatiana's life becomes apparent in a letter to her aunt Xenia in January 1918. "Does your Commissar read all the letters like ours?" Tatiana's diaries for this time period are not complete, and kudos to Miss Azar for including excerpts from correspondence, biographies and other diaries of family members, servants and contemporaries. The inclusion of the material, which always references Tatiana, enhances Tatiana's own words. We see her through other eyes which help us to understand her and the life she lived. The material for this book was obtained from the State Archives in Russia and in US libraries, including the Beinecke Rare Book and Manuscript Library at Yale. The illustrations come from the State Archives, and most have not been published before... at least I have never seen them. Russian Imperial expert Nicholas Nicholson is the book's co-author. He is responsible for the numerous annotations (footnotes) that will help the general readers with the historical and political references and identifying family relations as many are identified only by nicknames. This is an important work, true scholarship in the Romanov canon. Westholme also published Helen's The Diary of Olga Romanov: Royal Witness to the Russian Revolution.